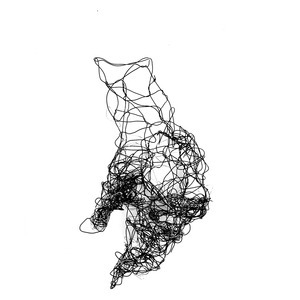 A swag of interlocking three-dimensional drawings of hands in wire. The swag refers to Flaxman’s Wedgwood designs. John Flaxman R.A., 6 July 1755—7 December 1826, was a British sculptor and draughtsman, and a leading figure in British and European Neoclassicism. Early in his career he worked as a modeller for Josiah Wedgwood’s pottery. He was a prolific maker of funerary monuments, including a monument to Nelson in St Paul’s Cathedral. 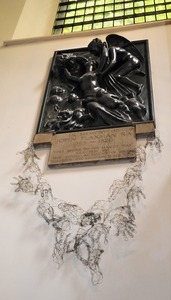 Placed under the memorial to the artist himself, Grace Adam chose to focus on Flaxman’s draftsmanship, which was central to his practice. A collection of his drawings, close by at The Flaxman Gallery, UCL, provided an insight into his use of line, and economic style as a way of working out ideas for commissions as well as recording those close to him.